Most Search Engine Marketers (SEMs) will have to step in on already running projects and deliver results. I have built a process to take a page of content that already exists and improve it for users and for search engines. This process was created for working with interns, so that they will have a framework to follow to improve website content. I am going to us a case study of a client with luxury hotels in Croatia to show how this can be applied to a real life example. 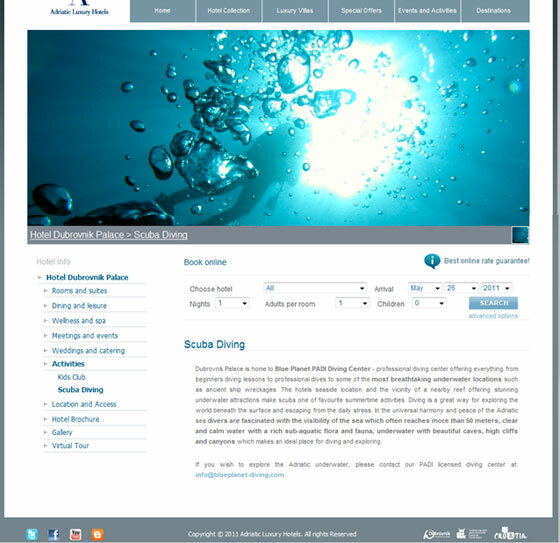 The clients only mentioned one of their big selling points, scuba diving holidays, in passing on their website. The Hotel Dubrovnik Palace has a full PADI diving school attached to it and a crystal clear diving spot right in front of the hotel. Their website currently focuses on the end of the buying cycle; getting people to book a hotel room right away. They don’t use informational or inspirational content to target people earlier in the buying cycle, when people are looking for information on where they want to go on holiday. If you, like me, are stuck behind a desk in a cold, rainy part of the world, I apologise for the images you are about to see. The page below was their original activity page to promote a diving holiday in Dubrovnik. Diving in Dubrovnik is amazing but this short bit of text is not going to convince an American diver to swap their Cozumel dive holiday for one in Dubrovnik, Croatia. So let’s dive into how I could give this problem to an intern to solve. The client approached us after they had already had their website built and spent their budget. This will be familiar to SEMs; you have to create value with few resources. In this case, we have stuck to their original page structure to minimise the work their developers need to do to implement improvements. When working with interns, clearly setting these boundaries early in the process means I am more likely to get appropriate content back from them. These are the tools I find useful and examples of how I get the most out of them. There are a number of alternatives to each tool, but I stick to a core set that I understand and am familiar with so that I can explain them to interns and get a consistent output. 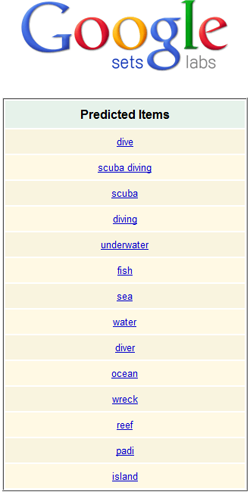 Very quickly I can pick up new keywords to expand my content with, like “scuba” and “snorkelling” as well as conversion related words like “dive shop”, “dive center” and “diving equipment”. Luckily the hotel has a PADI dive centre on its lower floor so it’s a perfect match to search queries. I hope to be able to rank for all these “halo” diving words quite easily. You can see from the competition column that there is not a lot of PPC activity around these terms, meaning I can cheaply drive Paid Search towards this page. Google Sets automatically creates sets of items from a few examples. As I want to add more text to the page, I also want to make sure the text I add is strongly related to my main keywords. From this output will make sure to include words like “fish” and “wreck” and “island”, to attempt to capitalise on what Google is telling me is its contextual understanding of my main diving terms. Next we turn to divers themselves to find out what they want in a page. I searched Google for diving forums and found one that seemed active. I signed up and asked them what information they would like to see in a diving page. Although I grew up on the coast, there is no way I would have known this specific diving data without asking the experts. I only thought of doing this after the page went live, but I will be doing this as part of the initial process going forward. This is one of those things that seem so obvious when you do it, and you kick yourself that you didn’t do it before. This is the reason for creating an iterative process; we will improve this page over time, based on data. There are two main reasons for using multiple types of media on the page. From a conversion point of view, users are hitting this page are early in the buying cycle; trying to make decisions rather than buying straight away. Adding data and utilising rich media allows me to educate and inspire users, rather than immediately driving a hard sell. I am making sure I can link content to social sharing, to build audiences outside of search. This is one of the main drivers to adding Call to Action to drive people to Facebook and Twitter, so that we are not dependant on search for all our traffic. I personally found this video on youtube to be inspirational and a little unusual, so we have run with it. With Google’s recent Panda updates negatively affecting low quality, generic content, I am writing content that provides a lot of specific, useful content, utilising multiple media types to make sure that content is more likely to be counted as unique by their algorithms. Using multiple media types also allows us to rank in different search verticals – organic, image and video search. Seomoz’s Latent Dirichlet Allocation (LDA) tool allows us to make measurably better content and gives us a focused process of content development. LDA is a form of topic modelling whereby search engines can pick up the main keyword focus of a page by evaluating the semantic connectedness of other keywords on the page. We input our page text and then check for relevance against a specific keywords. These would be keywords we are interested in ranking for organically, using for PPC or believe are closely related to our main keyword topic, in order to add relevant, supporting contextual keywords. 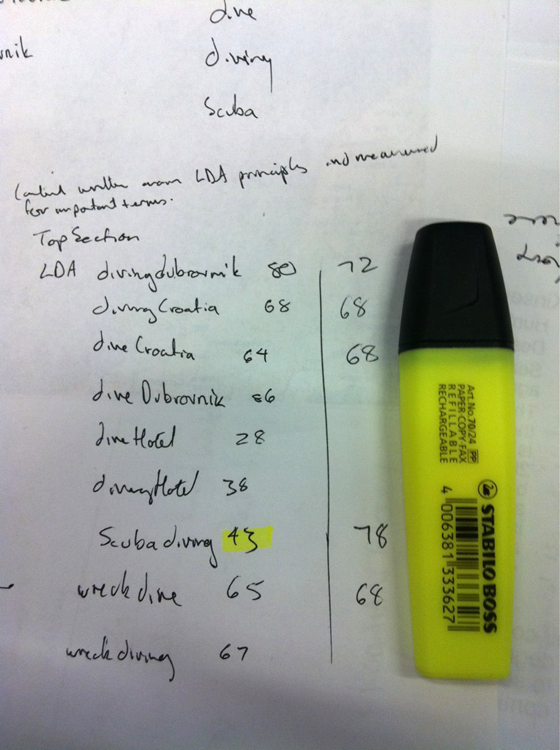 You can see in my first pass I had a low score for the important term “Scuba diving”. I reworked the text and improved the score on the second pass. “Scuba diving” is an important term not just from a user point of view but from a search point of view, in setting the page context via keyword usage. So what the point of doing all this work if you don’t get results? Let’s have a look at the page we made and how it has performed for us so far. Stephen Croome is interested in getting companies to re-engineer their products to market themselves. He works in-house as Search and Social Manager at Illustrated London News or mucks about with marketing strategy at firstconversion.com. You can follow his chaotic attempt to be a "proper SEO" on twitter @firstconversion at your own peril.